Medaesthetics™ is proud to introduce the latest generation of Vaser™ 2.2 Liposuction in Perth, Western Australia. Vaser Liposuction involves the use of special cannulas which emit high-frequency ultrasound waves capable of melting fat under the skin. This molten fat is then very easily sucked out using traditional liposuction technique. 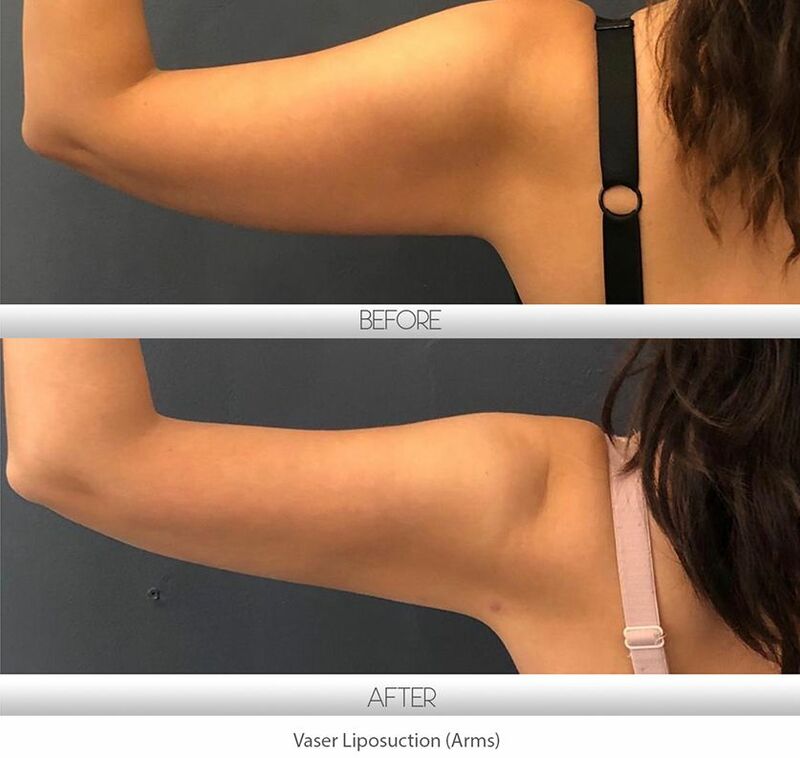 Dr Jadoon combines Vaser and Power Assisted Liposuction (PAL) using high speed vibrating cannulas, in a single treatment, to safely and effectively remove excess fat and is renowned for achieving natural-looking results with high patient satisfaction rates. Liposuction and liposculpture both refer to the method of removing excess fat from problem areas using small cannulas. The term liposculpture is more commonly used when liposuction technique is used in smaller areas to reshape the female figure or define the male physique, implying a more artistic procedure. What is 3D Power Assisted Liposuction (PAL)? To reduce the physical demands of traditional liposuction, MicroAire™ Surgical Instruments developed a power-assisted cannula that works by gently vibrating back and forth, at speeds that are barely visible to the eye, and which are gentle to the touch. This patented improvement allows the cannula to pass through fibrous tissue with remarkable ease, and provides greater precision and control for the surgeon. It involves removing the deep fat layer first and then progresses to a more superficial level, shaping from the inside out in a 3D plane. The result is a sensual, aesthetic shape, which compliments the beautiful figure and contours of the body. While the PAL innovation achieves the goal of making liposuction easier for the surgeon, it also provides meaningful patient benefits. Primarily, PAL passes through fibrous tissue without tearing it, without damaging micro-vessels, and leaving the fat cells (called adipocytes) intact for autologous grafting to other areas of the body, if so desired. Cell viability is becoming increasingly more important because of a new process called fat transfer, or fat grafting. In this procedure, a surgeon uses liposuction to harvest fat cells through a closed, sterile system which maintains the viability of the living cells within the fat. The surgeon can then re-inject a portion of the patient’s own sterile fat cells into other areas of the body or face to enhance areas that may have lost volume over time. PAL produces higher cell viability than heat-based methods that destroy the fat cells during liposuction. Use your imagination to picture the fat in your body as grapes on a grapevine and your connective tissue as the leaves and vines. PAL’s patented reciprocating action gently shakes the grapes loose, leaving the vines and leaves intact. Heat-based methods such as laser or radio-frequency methods cause the grapes to explode and may burn the vines and leaves. Traditional manual lipo procedures may tear apart the whole grape-bunch, and extract everything, including the vines and leaves. With these methods, the grapes are destroyed and the vines and leaves are damaged. Less bruising, swelling and Trauma. Improved patient comfort and safety. Faster healing processes as the tissue surrounding the fat are not destroyed. Most healthy patients are usually back to their regular routine within 10 to 14 days. Post-operative surgical discomfort generally only requires paracetamol with codeine to control it. Will PAL 3d liposuction stop me from gaining weight in future? By the end of adolescence, most people have produced a fixed number of fat cells, which will be with them for their remaining years. After this, if a person gains weight, then the pre-existing fat cells grow larger, rather than the body producing more fat cells. Many patients find that liposuction results in a psychological boost that gives them renewed confidence and more incentive to lose weight; in some patients weight loss seems easier post liposuction. It is important to follow a healthy and active lifestyle. Who can benefit from PAL 3d liposuction ? The best candidates for PAL liposculpture have firm elastic skin, are in good health and have tried to eliminate bulges through diet, exercise and weight loss. Liposculpture and liposuction are not suitable for people who are simply overweight. It is a body reshaping procedure not a weight loss procedure. Skin-Pinch Test. The thickness of the treated area measured before and immediately after 3D Liposuction. Dr Ehsan Jadoon’s patient. What is the difference between tumescent liposuction, SmartLipo, vaser liposuction, powered assisted liposuction, CoolLipo, Laser lipo etc.? Tumescent liposuction is a surgical procedure of removing fat from a body area after a special local anaesthetic fluid infiltration (called tumescent fluid). All other types of liposuction are different company trademarked names of devices and instruments (lasers, ultrasound, radiofrequency etc.) that aid in that process. They are all used as part of the tumescent technique, not in lieu of it. How long do the effects of the liposculpture last? The effects are usually permanent if you maintain a healthy and active life style. However if you put weight on later, the fat cells can return in that area. Many patients find that liposuction is a psychological boost that gives them more incentive to lose weight and in some patients, weight loss seems easier post liposuction. It is important to follow a healthy and active lifestyle after this procedure. If a patient does not gain weight after liposuction, fat does not accumulate in other areas of the body. However, if a patient gains a significant amount of weight, then that fat has to go somewhere else. It is important to follow a healthy and active lifestyle to prevent this. While you will see some results straight away, you will not see the full result of your treatment until all swelling has settled down. This usually improves over the first few weeks. After 10 days you will have a good idea of the effect of the procedure, and after six weeks you will see around 85% of the result. At six months the full effect of the procedure is clear. What can I do to ensure I get the best results? The compression garment is vital as it alleviates pain and also prevents swelling. It is important that you continue to wear the compression garment for the period prescribed by your doctor as it also aids the body in recovery and ensures the skin contracts evenly. From the second day following your surgery it is advised that you do some low impact exercise (such as walking) for 30 minutes a day to encourage blood circulation. There are also some massage techniques that can assist which we will discuss with you. You can return to non-strenuous work within two days but should not attempt more strenuous activity for the first two weeks. This depends upon the body area treated and the amount of fat removed. For smaller areas like chin or inner knees, most patients are able to resume work within 5-7 days. You should not resume heavy exercise for at least two weeks. Patients are reviewed the next day as well as one week following their surgery. Third review is usually scheduled after four weeks to 8 weeks. Will there be scars from the procedure and how noticeable will they be? Incisions performed during liposuction are only 3–4 millimetres long and usually heal rapidly. After several months the scars are usually not noticeable. What are the risks of liposculpture surgery? Like any surgery, liposculpture carries some risks. Although complications are quite rare, they can include infection, which is very uncommon. It is thought that the tumescent fluid is also antibacterial. Other uncommon risks include post operative bleeding and collection of fluid in a small pocket under the skin (seroma). There are some other more serious risks of liposuction including fat embolism. Fortunately they are very rare. This will be discussed at the time of the consultation. Liposuction improves the silhouette of the body, but does not necessarily eliminate the pre-existing cellulite. It does reduce the degree of cellulite to a minor extent but it is unlikely to produce a significant improvement. Am I a candidate for a tummy tuck as well? The only patients who may need a tummy tuck in addition to liposuction are those with significant degrees of lower abdominal skin laxity, unusually extensive stretch marks, or severely stretched abdominal muscles (as a result of pregnancy). After liposuction, abdominal skin often contracts to a reasonable degree so that an excision surgery (tummy tuck) is not necessary in majority of cases. Your doctor will assess you at the time of consultation to see which procedure is suitable for you. Liposculpture costs depend upon the number of areas being treated and the time it takes to perform the procedure. One area costs $3,850, all inclusive. At Medaesthetics®, the procedure is done under local anaesthesia. This offers a very cost effective alternative to traditional liposuction with less downtime and risks which are associated with general anaesthesia.